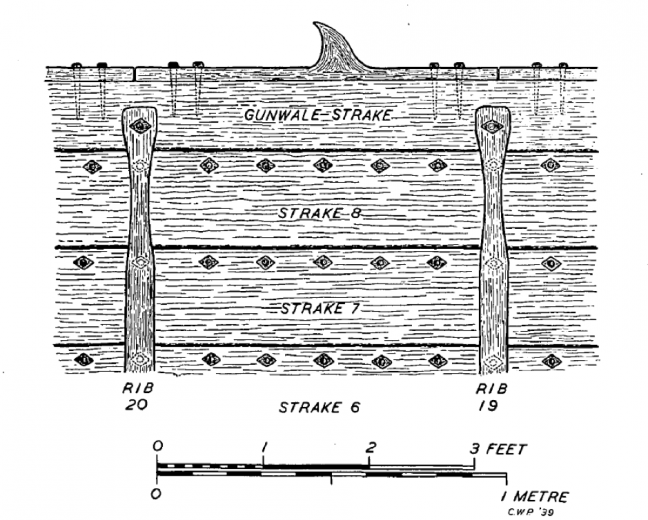 For hundreds of years either side of the Sutton Hoo ship, North Sea vessels had provision for oars all the way along, with no break in the middle. So were there ever any central tholes at all? In the Bayeux tapestry the English ships have no tholes amidships, while the Norman ships were tholed all the way along. So maybe our ship was the same, over 450 years beforehand. Separate the tholes into separate items the way Phillips did, as indicated by the red lines. 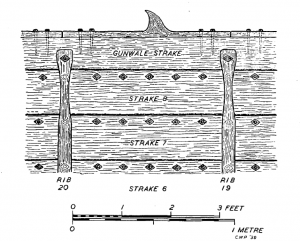 Suddenly if looks as if each thole could have been demountable – provided that the holes where the spikes go through were a slightly loose fit. The hooks of the tholes were midway between the thwarts, and would have been a nuisance when loading or unloading. So simply whip them off. Make the tholes one standard pattern so you wouldn’t need to remember where you took them from. Then they could be slapped on like pieces of Lego when you needed them again. Before adding the burial chamber, such tholes would be easy to deal with, but you’d also need to remove the spikes. However, the way Crosley drew them they were not embedded nearly so deeply into the gunwale. You’d have plenty to aim at, hitting them from the side. Wrought iron is not likely to snap. The spikes should be easy to pull out, and their iron would be valued. It’s bonkers. But how can you disprove it? The spikes outside the area of the burial chamber are only circumstantial evidence. All the same, are there any volunteers to check their spacings in the photos in the British Museum?